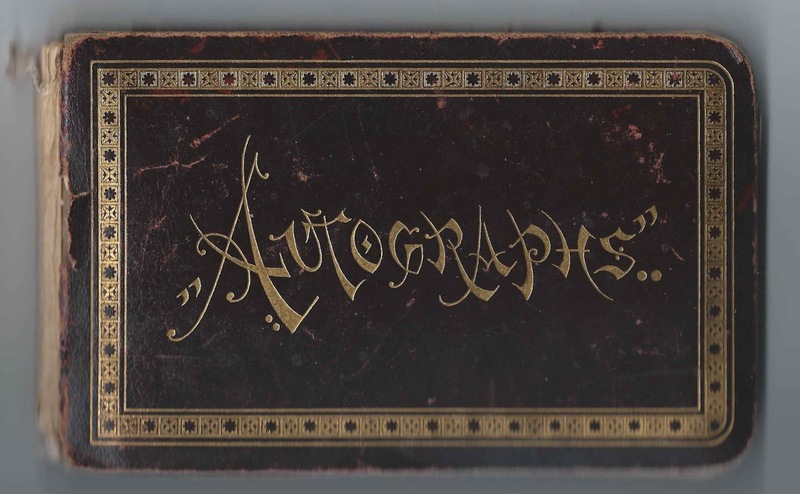 1884-1908 autograph album that belonged to Annie J. Ross of Boston, Massachusetts. Several signers indicated their membership in the Chautauqua Literary & Scientific Circle; presumably Annie was also a member. The album is approximately 7" x 4-1/4" and contains the sentiments of 59 of Annie's relatives and friends. An alphabetical list of the signers appears at the end of this post and contains relevant information. A few of the pages include notes added later, presumably by Annie, indicating that the signer had died. Annie J. Ross was born about March 1866 in New Jersey, the daughter of William and Helen M. (Hurd) Ross, who were born Norfolk, Virginia, and Wiscasset, Maine, respectively. As shown by the 1870 Federal Census, the family of six was living at Charlestown, Massachusetts, where William was working as a "currier". 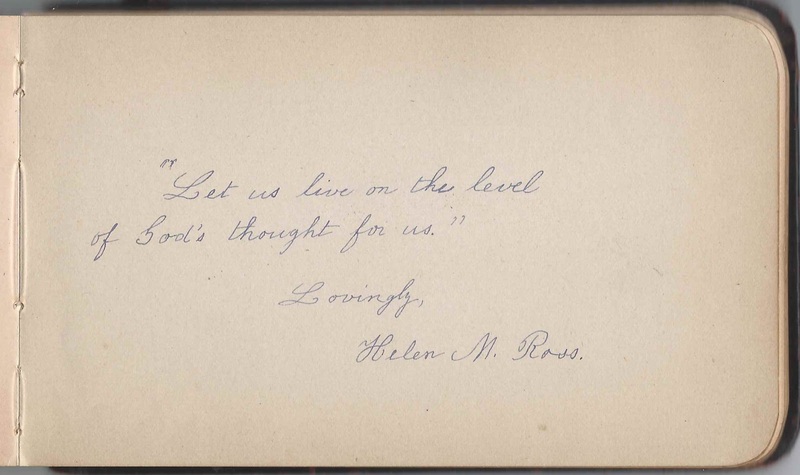 Annie's mother, Helen M. (Hurd) Ross, inscribed a page in the album. Two of Annie's siblings signed pages in her album. Helen Virginia Ross inscribed her page in Charlestown, Massachusetts. 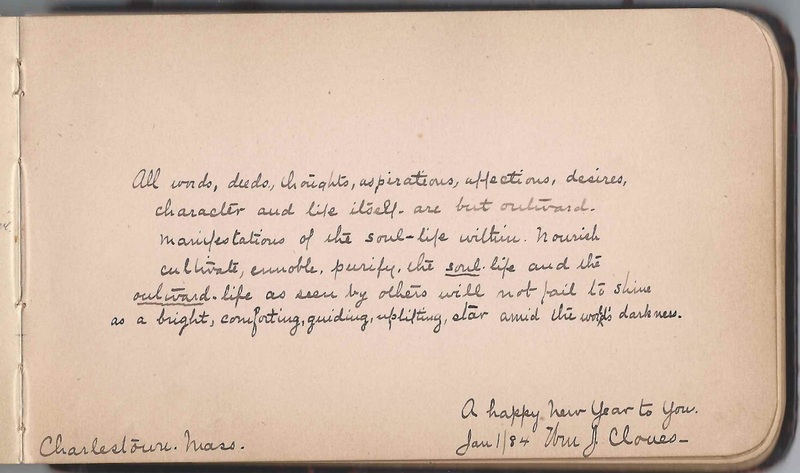 Her future husband William J. Cloues signed the right facing page. 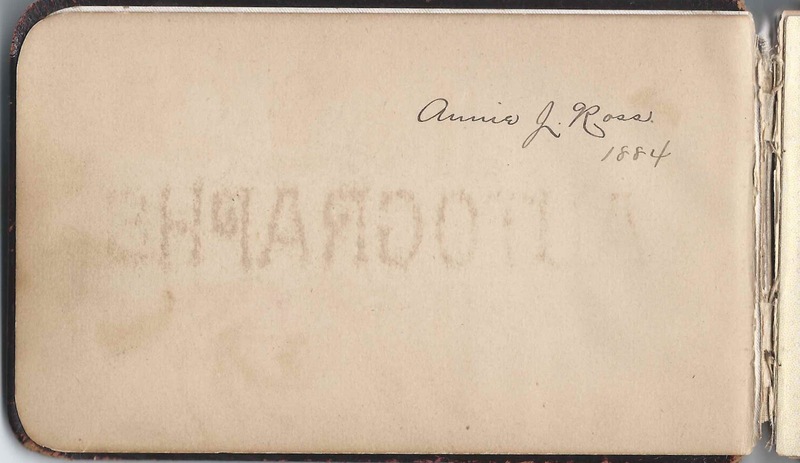 Annie's brother Clarence A. Ross of Charlestown, Massachusetts, signed a page on February 15, 1887. He included an interesting reference: "Toronto - 17". Up through the 1920 Census, it appears that Annie had not married. Perhaps she never did. In 1920, she was in living in a household with Caroline Caswell and Myra L. Higgins. They dealt in fancy goods. 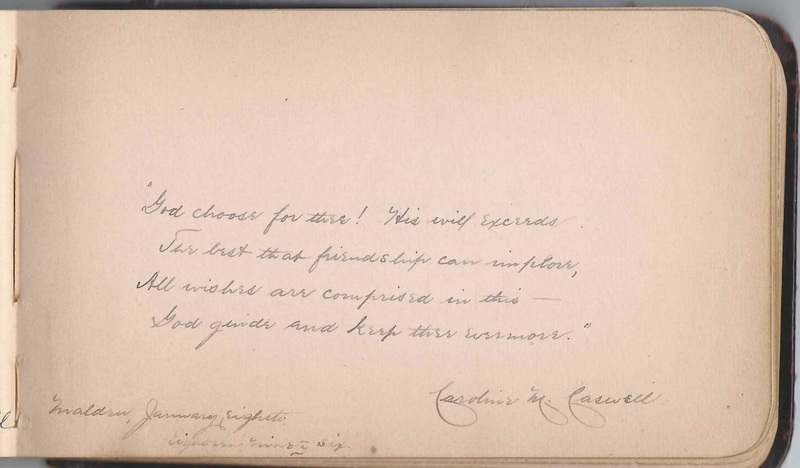 Incidentally, the album contains a page signed by Caroline M. Caswell of Malden, Massachusetts, on January 8, 1896. Another signer who may have been in business with them later on was Nellie E. Cook. 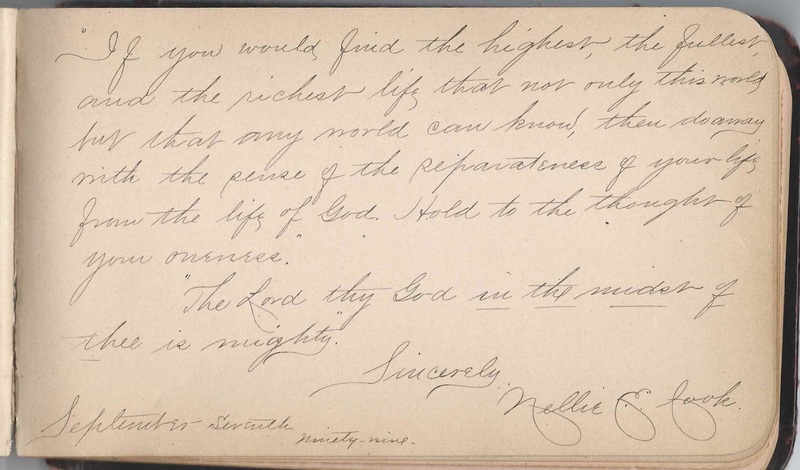 She signed a page on September 7, 1899. As noted above, several signers included the initials C. L. S. C., which stood for the Chautauqua Literary & Scientific Circle. 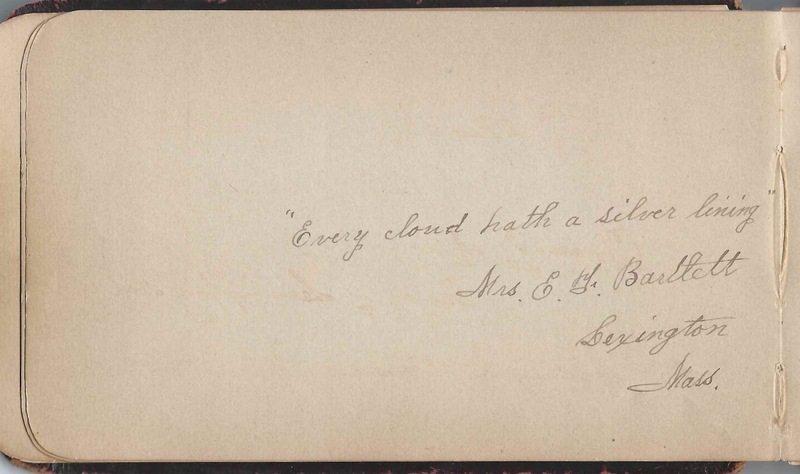 One of them was Lillia T. Wetherbee of Dorchester, Massachusetts, who inscribed her page on January 26, 1889. Facing pages were signed by Rev. William Bartlett, pastor of the Lexington Baptist Church, and his wife. Lucy E. Baker of Southboro, Massachusetts, signed at Lake View on July 24, 1885. "C.L.S.C. '87" Chautauqua Literary & Scientific Circle. Mrs. E. F. Bartlett of Lexington, Massachusetts. I believe that the signer on the right facing page was her husband Rev. William Bartlett, Pastor of the Lexington Baptist Church. 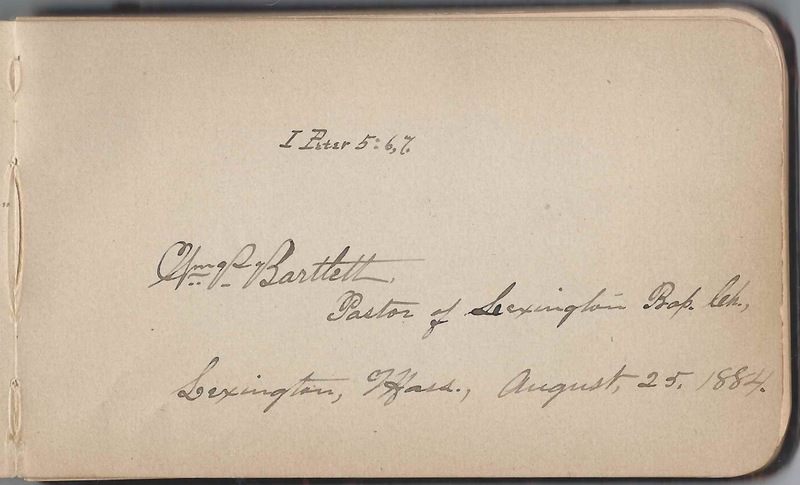 William Bartlett, Pastor of Lexington Baptist Church, signed at Lexington, Massachusetts, on August 25, 1884. His middle initial might be P. The signer on the left facing page, Mrs. E. F. Bartlett, might have been his wife. M. Alice Blaisdell, signed on January 5, 1885. Later note: "Died Nov. 30, 1885"
Cora M. Blandin of Charlestown, Massachusetts; Paney, Class of '87, C.L.S.C., Chautauqua Literary and Scientific Circle. Robert H. Magwood of Boston, Massachusetts, signed at Framingham, Massachusetts on January 27, 1889. "B.O.C. '89"
Susie M. S. Perkins, signed on December 4, 1890. Later note: "Died Nov. 1891"
Annie J. Ross, 1884. 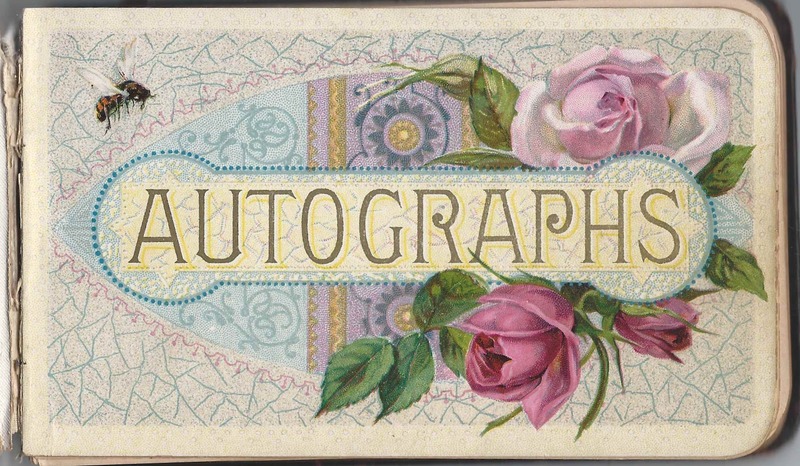 Album owner Annie J. Ross started compiling autographs in this album in 1884. 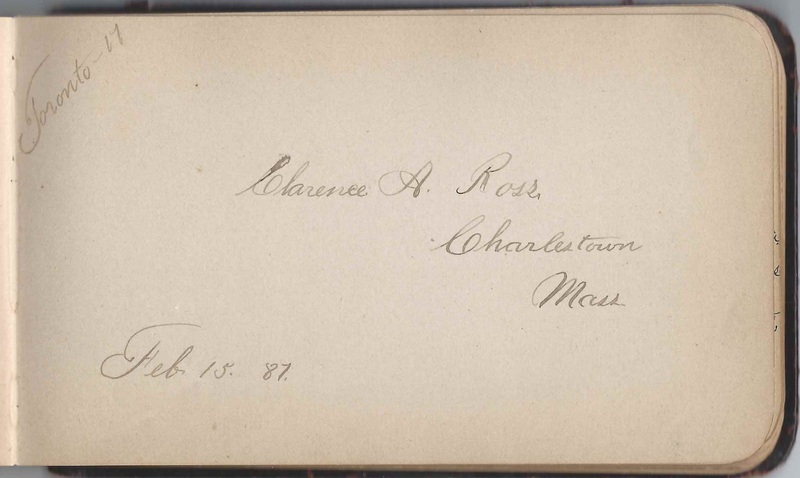 Clarence A. Ross of Charlestown, Massachusetts, signed on February 15, 1887. 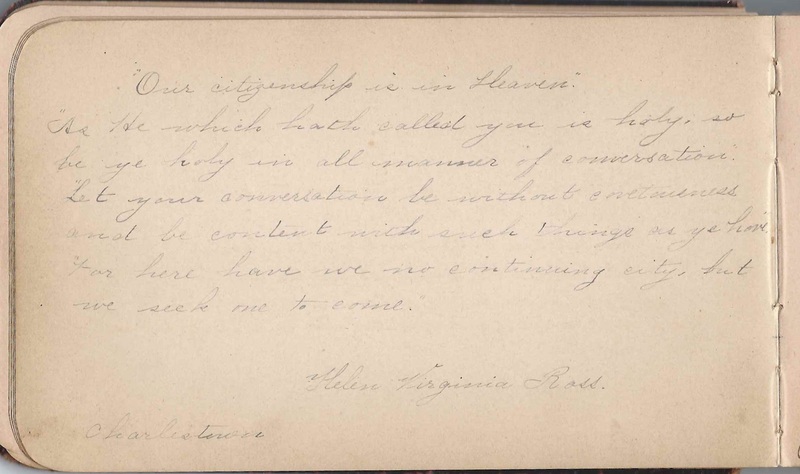 "Toronto - 17"
Lillia T. Wetherbee of Dorchester, Massachusetts, signed on January 26, 1889. 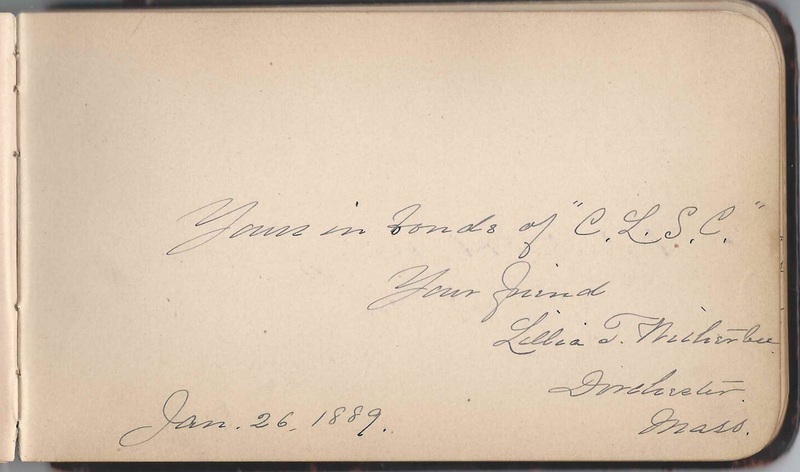 "Yours in bonds of "C.L.S.C."